Firebreather Fitness is Greg Amundson's program to help you get into the best shape of your life--physically, mentally, and spiritually. Former SWAT officer, DEA Special Agent, U.S. Army Captain, and founding CrossFit athlete and coach, Greg Amundson is a globally recognized leader in functional fitness conditioning and anti-inflammatory foods and diet. 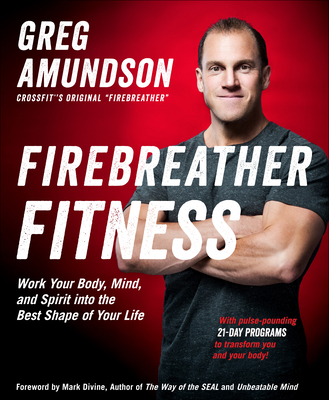 Known as CrossFit's "original firebreather," Amundson shares his secrets, advice, and the experiences that helped him forge his Firebreather Fitness--a fitness of body, mind, and spirit. It takes more than a hard body to excel at work, in the gym, and in life. Firebreather Fitness folds in the cutting-edge mental toughness training and time-tested spiritual practices that guide Amundson and the athletes he coaches. Amundson's smart and effective guides to goal-setting, pain tolerance, honing purpose and focus, and exerting control over your mental state offer invaluable tools to help meet any challenge. Packed with practical advice, vetted training methods, and Amundson's guided workout programs, Firebreather Fitness is a must-have resource for athletes, coaches, law enforcement and military professionals, and anyone interested in pursuing the high-performance life. Greg Amundson is a former SWAT officer, DEA Special Agent, U.S. Army Captain, and one of the founding athletes and coaches of CrossFit.Known in CrossFit as the "original firebreather," Amundson hasspent over fourteen years in Military and Law Enforcement service, including details as a Special Weapons and Tactics Team Operator (SWAT) and Sniper in Santa Cruz County, a Captain in the US Army, a Special Agent with the Drug Enforcement Administration and an Agent on the Border Enforcement Security Taskforce (BEST) Team. A former owner of the very first CrossFit gym, Greg has traveled around the world teaching CrossFit movement, theory, and application. He owns the gym CrossFit Amundson Santa Cruz and Krav Maga Santa Cruz.TJ Murphy isa veteran journalist, endurance athlete, CrossFitter, and former editorial director of Triathlete, Inside Triathlon, and Competitor magazines. He is author of Inside the Box, and co-author of Unbreakable Runner. He is a five-time Ironman(R) finisher and a 2:38 marathoner.